I like to use a little more sausage than she does, but otherwise it’s her recipe. Actually, it is a very traditional Italian recipe so it is really not Marcella’s invention. This recipe is so simple and quick that it is almost scary. 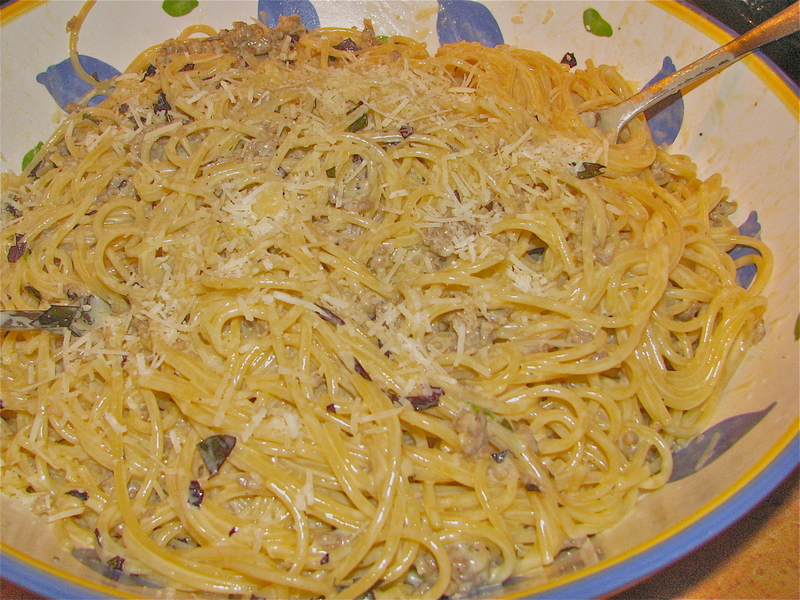 It is even easier than Spaghetti alla Carbonara, and I didn’t think that was possible. The resulting dish is so unique and different that everyone will be glancing over at you wondering, “Who IS this guy?” It is an amazingly versatile dish – it works for two in love, a small dinner party or a large gala. Since it includes sausage, cream, pasta and cheese on top, it’s difficult to find any nutritionally redeeming value in the recipe – but after you have tasted it, you won’t care. I am not proposing this as standard fare, but once you try it the first time, you will definitely get the urge again. Marcella suggests a bowtie, rotini or other smaller, formed pasta that will catch the bits of sausage. I find that spaghetti works just fine and is my preference. She also likes sweet sausage, but the hot is also good if you palette can take it. Add one tbsp. of olive oil and one tsp. of salt to a pot of water and turn heat to high. Add one tbsp. of olive oil and the butter to a 10” skillet and cook the onion over medium heat until soft – about 5 minutes. Add the sausage and cook for about 7-8 minutes, breaking the pieces apart as much as possible with a wooden spoon. Add the cream and scrape the bottom of the pan to deglaze. 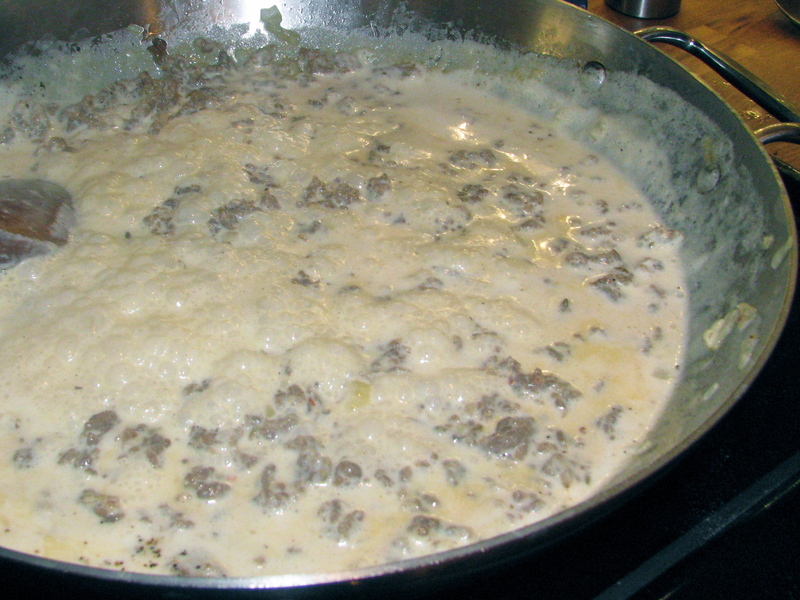 Bring to a simmer until cream begins to thicken – about 3-4 minutes. Taste and adjust for salt and pepper. Turn off the heat and set aside. The water should now be boiling. Cook the pasta until “al dente”. Drain but don’t rinse (actually, you should never rinse pasta) and put into a serving bowl. 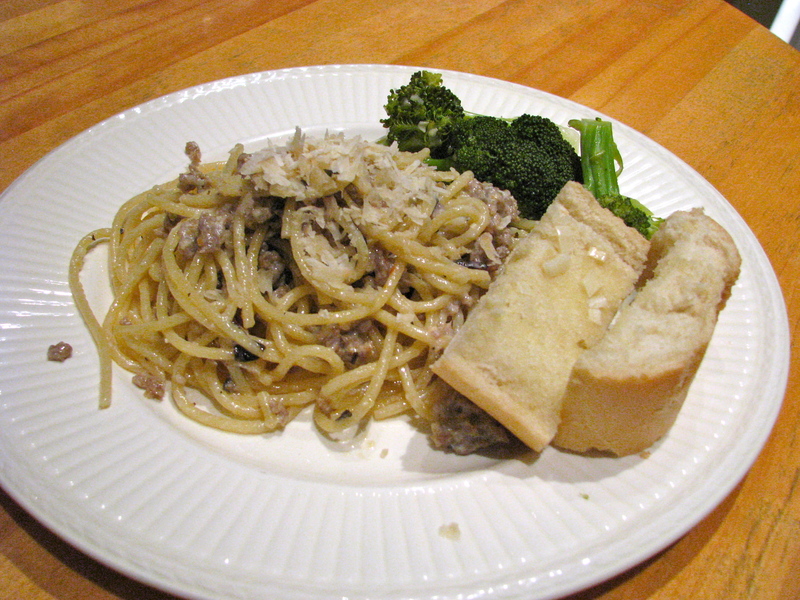 Pour the sausage and cream sauce over the hot pasta, toss and serve with grated Parmesano Reggiano. You can serve this dish with a lemon broccoli. The lightness of the veggie offsets the slight heaviness of the pasta. Add some garlic bread if you wish. Love the “print & pdf” button! What a great addition to your site. I can’t wait to try the recipe, although I’ll have to eat vegetarian for a week to offset all that sausage and cream. We liked the recipe so much, we’re having it for dinner tonight! Just made this for Sunday supper. Easy and delicious! The only problem is that there are no leftovers since we ate it all. I use Italian turkey sausage and thus feel less guilty about the calories and fat. Of course, it’s the fat that makes it so good.